I have been working with a small specialty Mill looking for a fabric for my boats. The new Premium 6 oz. fabric has a very tight weave and a very smooth finish. 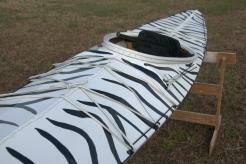 It feels to lightweight to use on a skin boat but it’s looks are deceptive! The mill says that compared to our original 8 oz. 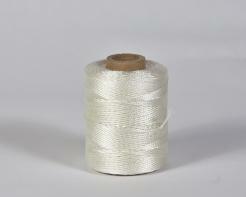 and this fabric it is actually much stronger because it is made with higher quality fibers and has a better weave. If it has a drawback it is that it has virtually no shrinkage left. They use a pre-shrunk fiber so there is no shrinkage to speak of. So you must sew this tight around the frame. The tight weave makes that easy to do and with only very small pull holes. Drum tight no problem. The smooth weave also makes for a very nice finish once painted. The Premium 6 oz is made in America by a Mill that makes small runs of specialty fabrics for some unusual uses. They had never dealt with skin boats but were very helpful with the technical side of choosing a fabric. The price reflects the quality of this fabric but remember not to focus on just the price of the fabric, keep in mind the total cost to the boat. There is nothing that comes close to the quality and low price of my boats! I used this fabric to cover my Firefly kayak and it worked great. 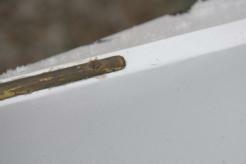 I used canvas stretch plyers to pull it tight around the coming and the double Ford process for the remainder. It was drum tight and required very little ironing. Painting was a breeze and was pin hole free after 3 coats. Definitely worth the extra cost! Very pleased with the 6 oz. polyester. Not difficult to put on. Easy to paint and looks great. Most important of all, no leaks!!! This skin is great to work with. Stretches on tight, virtually no pinholes. Great to paint! Worth the price in time saving and finished kayak quality. I built the Stonefly canoe. This fabric worked great for me. Yes, you need a canvas stretch pliers to pull it tight. There is little shrink left for heat. I stapled all mine to the gunwales. My skin is wrinkle free! At first, I thought no way, but keep at it and it will all work. i used this fabris to skin my stonefly.streched it tight,and ironed off the ripples due to stapling (the square ones).i am quite pleased with the result:as tight as a drum.don t know yet about wearing.